Jerome Nicholas Vlieland: Maria Elizabeth and Jan Vlieland. 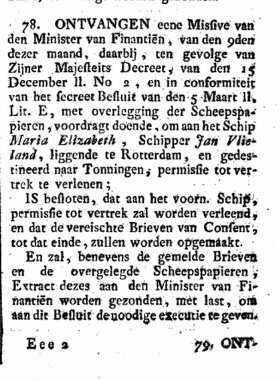 of the 15th of December last number 2 and conform the decree decision of the 5th of March last.Lit E.With presentation of the ships papers to the ship Maria Elizabeth, skipper Jan Vlieland located in Rotterdam destined to Tonningen given permission to leave. All guidelines from Napoleon 1807 . It tells us all there is to know about his army , what they had to do , had to wear and so on . And for the captains permission to sail with their ship. just as his brother Jeroen Vlieland ,Jan Vlieland also had permission.